JAKARTA (10/7/2015) – An active role in the provision of supporting infrastructure for gas energy is always carried out by PT Pertamina Gas (Pertagas). Evidently, the current reality in which the transmission network of large-capacity gas pipelines have not connected all the island of Java, --- which is only available in West Java and East Java ---, answered Pertagas by constructing gas transmission pipelines segment Gresik-Semarang (Gresem ). Pipeline built along 267 km with a diameter of 28 inches and a maximum capacity of 500 MMSCFD will stretch from East Java to Central Java to pass 7 City / County ie Gresik, Lamongan, Bojonegoro, Blora, Grobogan, Demak and Semarang. Since delivery of the first pipe to the stockyard Tuo Alas Station, Semarang on May 22, 2015, progress Gresem gas pipeline project has reached 53%, "We are targeting completion in the first quarter of 2016," said Hendra Jaya, President Director of PT Pertamina Gas. 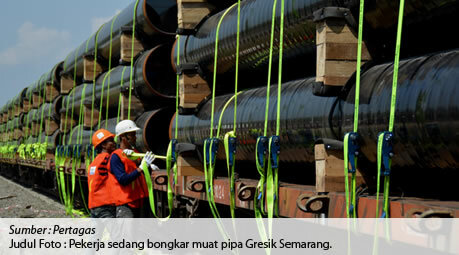 Gresem gas pipeline segment, according to Hendra, was built by Pertagas to supply gas from power plants and industries along the pipeline. From the year 2016-2018, the plan this segment will obtain gas supply from Kangean and Husky excess of 30 MMSCFD. Furthermore, the supply of gas which passes through this segment will get supplies from the Cepu field-Tiung Jambaran Blue and Cendana of 100 MMSCFD. Dream of uniting gas infrastructure in Java is certainly not finished only with building a pipeline segment from Gresik to Semarang. For this reason, Pertagas also expansively middle run other projects namely the construction of a gas pipeline in East Java, precisely Porong-RoW (Porti) as well as other lines of the section Cirebon-Semarang (Cisem). Porong pipeline (Sidoarjo) - RoW (Pasuruan) built along 56 km with pipe diameter 18 inches and a maximum capacity of 120 MMSCFD current work progress has reached 60%. While the development of gas pipeline Cirebon-Semarang along 255 km, Pertagas ready to cooperate with PT Industrial Engineering (Rekind) as the winner of the road construction. Through the construction of the pipeline sections, optimistic Pertagas gas infrastructure from East to West Java will soon be connected, so as to accelerate economic growth evenly in Java. "Dream Pertagas is building a gas pipeline in Java, which is longer than the way Anyer-Panurukan built by Daendels," said Hendra. As is known, the gas industry in the future will be very important for the growth of national energy, it is reflected in government policy on the target national energy mix. In 2025 the composition of the gas as alternative energy sources other than oil, targeted to increase by 126% compared to 2011. "Of course, the availability of gas infrastructure becomes an important key to achieve these targets," added Hendra.